It is possible there will be up to a billion Painted Lady butterflies flying in Britain in coming days. Conservationists say there may be opportunities to see butterflies in greater numbers than for years. Even if the weather is not sunny and warm throughout the UK, millions of butterflies should emerge in the areas that are experiencing good weather. However, they are warning this one-off phenomenon masks an underlying decline in British butterfly numbers. The message comes as Britain gets set to celebrate its annual Save Our Butterflies Week, which takes place between 25th July and 2nd August. The 14,000 members of the charity Butterfly Conservation will be participating in events up and down the country raising awareness of the problem. Scientists say it's vital for people to remain alert to the crisis facing Britain's butterflies. 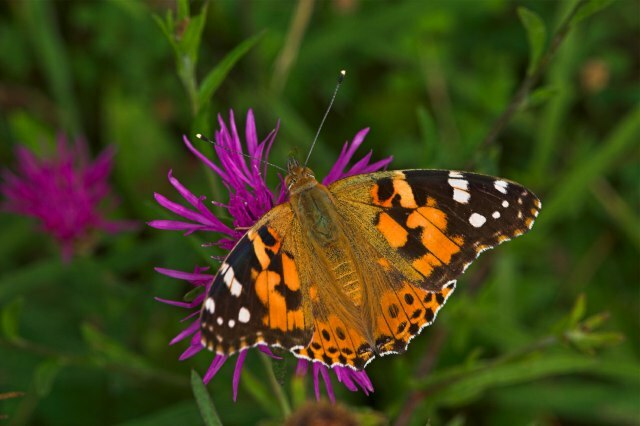 Richard Fox, Surveys Manager at Butterfly Conservation, says the abundance of Painted Lady butterflies has left many people confused as there has been a large amount of media coverage regarding the severe decline in British butterflies. "The Painted Lady isn't a resident butterfly. It migrates from North Africa and some years we see very few of them. This year conditions in the Atlas Mountains of Morocco were about as good as they get and allowed excellent germination of the caterpillar food-plants." By May swarms of Painted Lady butterflies were arriving in the UK. Now all those butterflies will have bred and a second generation is poised to take to the skies. Richard Fox said: "By all calculations it is possible that we could have up to a billion Painted Lady butterflies by early August. The Painted Lady does not overwinter in the UK and by autumn the vast bulk will have gone. The picture for native British butterflies remains mixed. Numbers appear to be up on the previous two summers, which were extremely wet and dire for butterflies. This summer has been better so far, in spite of the recent showers. If the wet summers had continued some endangered species such as the Heath Fritillary were vulnerable to extinction. The good news is the Heath Fritillary appears to have rallied and is having a good year. But numbers overall are still well down on a decade ago."